Slice the bananas and squeeze the lemon juice over them to stop them discolouring. Stir the dates in with the bananas. Mix the cream, jam and chilli powder in a bowl and stir through the bananas. The jam has some sort of reaction with the cream and makes it thicken very fast, so you may have to thin the salad with some milk. Stir as a side to some meat or as part of a braai. I've been wanting to make these for ages! I tried to make them last year and burnt them, so couldn't post them. We are having them as one of the dishes at our wedding and when we went for out food tasting recently, I remembered just how good they were and thought I'd try again. They are a typically South African dish usually cooked on a braai. 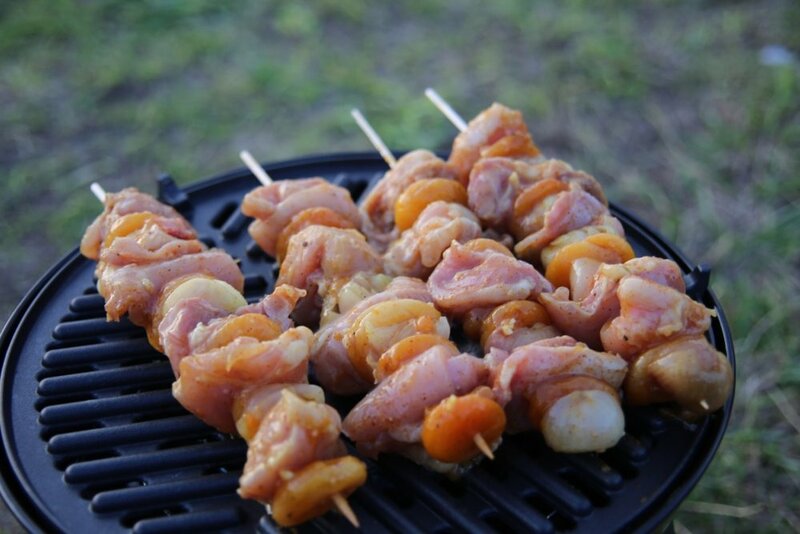 They are basically chicken kebabs on skewers with a curried marinade and dried apricots, they are so tasty! 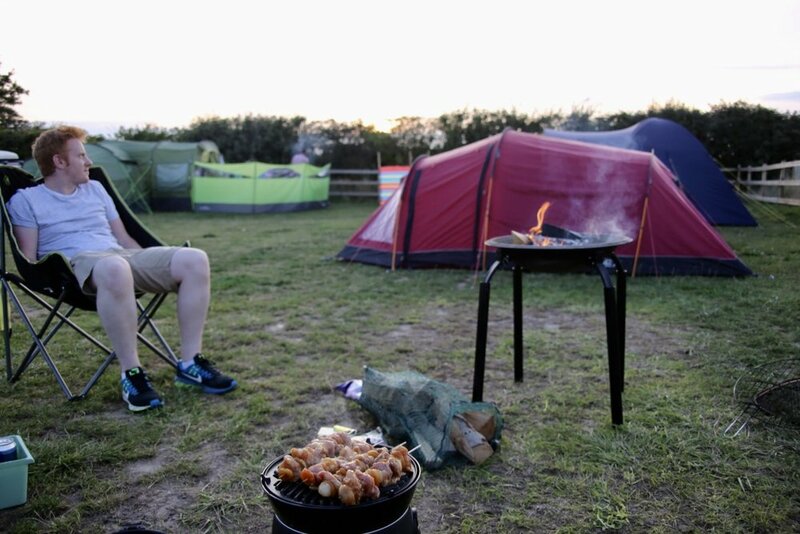 We made them to have on our braai when we went camping in Norfolk. You could cook them on a BBQ or on a griddle on your hob. Combine all of the marinade ingredients in a saucepan. Stir well, add the shallots or onions and bring to the boil. Boil for 5 minutes, until the sauce is thickened. In a bowl, mix the chicken pieces, apricots, shallots/ onions and marinade. Seal and leave in the fridge to marinade for at least 4 hours, preferably overnight. If your skewers are wooden, soak them in water for an hour or so. Thread the meat, onions and apricots onto the skewers. Cook on a BBQ or griddle over a moderate heat turning frequently for 20-25 mins. Ensure the chicken is cooked through and serve with salads and bread. Stir the sugar and yeast into the lukewarm water in a jug. The elderflowers are out! Well they have been for a couple of weeks already which means they won't be out for much longer. Every year I look out for them and they disappear as fast as they arrive, so you have to be quick! Once they are here though I know summer is definitely here and it has been glorious! I have read that the best time to pick elderflowers is early in the morning on a dry warm day. To be honest I haven't always followed this and my cordial has turned out fine. I am sure it will be even better if you do stick to this but don't stress too much! You will need about 20 heads of elderflowers for the cordial. Gemma from Stay and Roam has written a lovely post on how to identify elderflowers if you aren't sure what they are. When you go foraging make sure you don't pick anything on a main road, the further away from car fumes the better. Also remember to take some scissors, a bag or basket and a walking stick or long umbrella with a hooked handle so that you pull down those taller branches. You will need 5-6 750ml sterilised glass bottles (or enough bottles to hold 4 litres), a very large saucepan, a colander and a muslin or clean dish towel and a funnel to pour the mixture into your bottles. Karon from Larder Love has written a lovely post on sterilising jars and bottles. In a large saucepan add the sugar to 1.5 litres water and heat gently, stirring occasionally until all of the sugar has dissolved. Once the sugar has dissolved, turn up the heat and bring to the boil and then turn off the heat. Fill a bowl or basin with water and wash the flowers to remove any bugs or dirt. Remove the flowers from the water, shaking off any excess water and add them to the syrup along with the citric acid, lemon slices and lemon zest and stir well. Cover the saucepan and leave to infuse for 24 hours. Line a colander with a muslin or a clean dish towel and sit over a large bowl. Slowly add a ladle at a time of the mixture and allow it to slowly drip through the cloth. Discard any bits left in the cloth/ muslin. Using a funnel and your ladle pour the strained cordial into your sterilised glass bottles. You can drink your cordial straight away or keep it in the fridge for about 6 weeks. You can also pour it into ice cubes and freeze until needed. I've been meaning to make something with wild garlic since the start of the spring and now its nearly summer. I went out this weekend to pick some and a lot of it was dying off so I really caught the end of it. 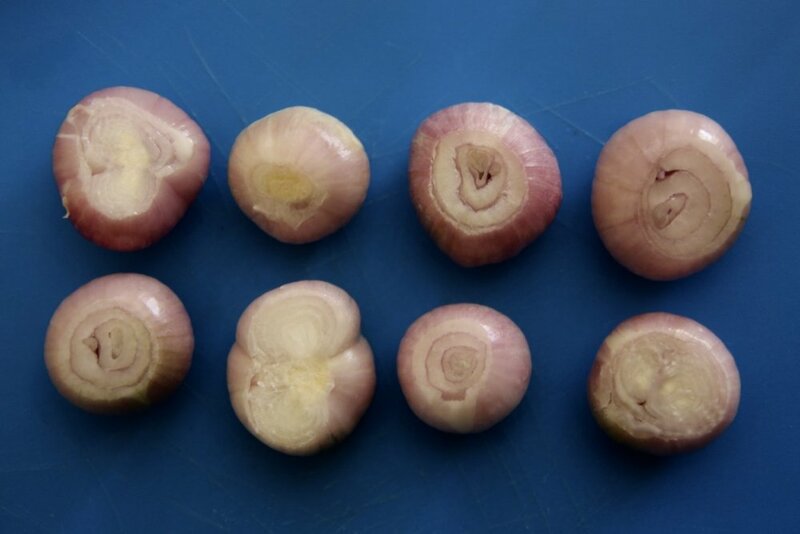 I used to regularly go cycling wth some friends around the villages near Basingstoke and every time we cycled around a certain area there was a really strong garlic smell. Only recently did I discover wild garlic and when I went back to the same area found the whole area covered in it (It finally all made sense!). I definitely don't remember the road being called garlic lane, so I either completely missed that or they have recently renamed it. I decided to try and make garlic mayonnaise as it seemed more appealing than soup on a really muggy day. This isn't my recipe, I have borrowed it from Mat Follas who I did a foraging course with a few weeks ago (will blog about that soon). I have tried to make homemade mayo a few times now and find it really fiddly usually resulting in a huge waste of oil and eggs and an even huger mess in the kitchen. This recipe was brilliant, totally foolproof, I made it in about 1 minute! Add the whole egg and egg yolk to a mug or a container large enough for your hand blender. Add the rapeseed oil and whizz. It should thicken and turn to a creamy colour straight away. You can add more oil if you want it thicker (I know it doesn't make sense and am not sure why it works like that, but it does). Note that it will thin a bit when you add the remaining ingredients. Add a splash of white wine vinegar, a squeeze of lemon juice and salt to taste. Tear your wild garlic leaves into pieces, add to the mixture and whizz. Serve with anything you fancy a bit of garlic mayo with. I had mine with jersey royals and asparagus from Winchester farmers market on the weekend for a truly spring British meal... nom nom. The mayonnaise should last for about 3 days covered in the fridge. South African fudge is nothing like English fudge. I was so disappointed the first time I bought fudge in England and discovered it was like a soft toffee texture! I think South African fudge is much sweeter and has a more slightly crystallised, sugary, grainy texture which still melts in your mouth. Most South Africans I know have a very sweet tooth... my grandad used to drink condensed milk straight out the tin on his way home from work, so fudge is just the ultimate sweet! The only thing that I have found it is similar to is Scottish tablet. I thought I would try amarula fudge for a change just to see how it turned out. This is my moms fudge recipe, with amarula added and it turned out really well. Still the same soft crystallised texture as standard fudge but with a hint of the creamy amarula. If you haven't tried amarula before it is the South African equivalent of Baileys, but made from the fruit of a marula tree (also known as the Elephant tree as elephants love the fruit and are known to get drunk on it! :-)). Grease and line a rectangular baking dish with baking paper. Add the water and sugar to a pot and cook over a medium heat until the sugar has dissolved. Add the condensed milk, amarula, butter and golden syrup. Bring to the boil for around 30 minutes until the mixture caramelised and thickens. Make sure you continually stir it over a medium heat as if you turn it too high or leave it too long it will burn. If you see dark bits forming you know its burning. You will know it is nearly ready when it changes colour and starts becoming very thick. You can test a little to see if it caramelises and tastes like caramel (be very careful and drop a bit with a spoon on a side plate as it is extremely hot and will burn!) or you can test with a thermometer to be safe if you have one, when the thermometer reaches 113 deg celsius you should remove it from the heat. Once ready remove from the heat and stir in the vanilla essence. Pour it into your greased dish and leave to cool for about 20 mins until it is firm enough to cut into squares. You have to cut it at the point as once it totally cools you will only be able to break it apart. Allow to stand for one hour before attempting to remove from the dish. When I think of food that I miss from South Africa I always think of coconut marshmallows. My Oumie always buys me a bag whenever I go back! So far I haven't found anywhere that you can buy them in England so I thought I would have a go at making them myself... and oh my gosh they were incredible! Better than the real thing. The homemade ones are so light and fluffy they L.I.T.E.R.A.L.L.Y. melt in your mouth! If you try them let me know how you get on... they were honestly so quick and easy and one of the best things I have made so far! Enjoy! Create a double boiler by placing a glass bowl over a pot with some boiling water in it. The bowl should rest on the rim of the pot. You only need a few centimetres of hot water in the pot, it should not touch the bowl. Bring the water to a slow simmer. Mix the gelatine with 80ml cold water and gently heat until the gelatine has dissolved. Add the sugar and stir until the sugar has dissolved. In a separate bowl combine the syrup, vanilla essence and salt. Stir the gelatine mixture into the syrup mixture and beat with an electric beater for about 15 minutes until the mixture has turned white and is light and fluffy. Pour the mixture into a greased square 22cm pan and leave to stand in a cool place until set. Spread the coconut in a baking tray and stick under a grill for a few minutes. Check this constantly and stir it around a few times to ensure it doesn't burn and browns all over. When the marshmallow mixture has cooled, cut it into equal squares and roll each square in the toasted coconut so that it is coated on all sides. Store in an airtight jar for a maximum of a week. Tonight I am flying to South Africa for 4 and a half weeks! I haven't been back for 5 years now and haven't been home to Durban for about 10 so this is a really big trip for me! I am excited and nervous at the same time. So many old friends to catch up with, places to see, foods to try... all very exciting! I probably won't update here while I'm away but will try and update facebook as much as possible and will have plenty to share when I am back. As I have been preparing for my trip away I thought I'd try make Bunny Chow for some friends... it is such an easy and great dish to make and everyone loves it! I made a simple lamb curry which I did in the pressure cooker, but you could use any curry recipe that you like... meat or veg! Bunny Chow comes from Durban. There is a large Indian population there and Indian food is really popular. The 'Bunny' was created during apartheid when black South Africans were banned from entering cafe's and restaurants. Cafe owners (known by the nickname for the Hindu mercantile class as 'Bania's') opened hatch windows offering take-aways to passers by. They served curries in hollowed out quarter-loaves of bread topped with a 'lid' made from the scooped out bread... these became known as Bania Chow. Bunnies were perfect for street food as no cutlery or crockery is needed... it is a messy affair that you eat with your hands, using the bread to dip in and soak up the curry, and breaking away the crusts as you go. If you ever go to Durban and order Bunny Chow, most people would never use the full-name. You would ask for quarter beans or mutton etc. If you are really hungry, you would earn local respect if you asked for a 'half mutton!' Also make sure your bunny has a bottom! Some dodgy places have been known to pass of the open-ended middle of the loaf to unsuspecting customers... these are known as a 'funny bunny!'. Heat a glug of oil in a large pot and fry your onions until soft. Add the garlic, ginger, chilli, star anise, cinnamon and cardamom pods and fry for another minute. Add the lamb and brown. To serve, mix your onion, tomatoes and lemon juice and set aside. Hollow out your quarter loaves of bread and fill with curry. Serve topped with the tomato and onion mixture, yoghurt and coriander leaves. Koeksisters (Pronounced Cook-sisters) are a very popular South African sweet. I haven't really seen them sold in the UK, other than at the odd South African food stall or shop. They are like a very sweet, sticky, braided doughnut soaked in syrup, crispy on the outside and gooey inside... and they are so delicious! I am a bit nervous about deep-frying (my mom once burnt a massive hole in our kitchen ceiling) so I asked if she could make them with me as she has made them many times before. They do take time to make and are a bit of a mission (they are much easier with two people), but are so worth it and you can make them in big batches to be frozen and eaten later. I only found out recently that there are two versions of koeksisters in South Africa... an Afrikaans version (the ones that I have made) and a Cape Malay version which are made in an oval shape and are made with more spices (cinnamon, aniseed, ginger, cardamom)... these sound amazing, but I have yet to try one! The way to make koeksisters so syrupy is by boiling them in hot oil and then immediately dunking them in very cold syrup. That way the syrup is absorbed into the koeksister rather than just coating the outside. You need to keep the syrup cold (which is not that easy when you keep dunking boiling hot koeksisters in it). We made the syrup the day before and kept it in the fridge overnight... and then split it into two pots which we rotated when the one we were using wasn't cold anymore. We also filled the sink with ice and kept the pot of syrup we were using sitting in the ice which really helped. You will also need a tray for your plaited koeksisters waiting to be fried, 1 large pot for frying (or a deep-fat fryer if you have one), 2 pots/ dishes for the syrup, 1-2 bags of ice to keep the syrup cold and a dish for the finished koeksisters. In a large pot bring the water to the boil and then add the sugar, ginger and cinnamon and stir until the sugar is dissolved. Remove from the heat and stir in the syrup, cream of tartar and lemon. Leave overnight in the fridge. Sieve the Flour, Baking Powder and Salt. Using your fingers, rub in the butter. Add the egg and milk mixture to the dry ingredients and knead for 10 mins. Cover your bowl with clingfilm and leave in the fridge for 2-3 hours. Using a rolling pin, on a floured surface, roll the dough out into a rectangle until it is about 5mm thick. Using a sharp knife, cut out rectangles about 10cm long and 5cm wide. Then for each rectangle, make two cuts lengthways leaving one side attached (so that it is easier to handle), so that you have three strips that you can now plait. Plait each one and at the end of the plait, press the ends together so that there are no loose ends. When you have plaited all of your dough (you will need to re-roll out all of the leftover dough ends), heat your oil in a large pot. You can test when the oil is hot enough by putting the handle of a wooden spoon into the pot so that it touches the bottom - when tiny little bubbles run up the spoon handle the oil is ready. Add your koeksisters to the oil - as many as you can without overcrowding them. You will need to turn them so that both sides turn a nice golden colour. When they are cooked, remove each one with a slotted spoon and quickly dunk in the ice cold syrup and after about a minute (allowing time for the syrup to be absorbed) move them to a tray or dish to cool before eating. They can be stored in the fridge soaked in the leftover syrup for up to a month or in a container in the freezer. Hertzoggies or Hertzog Cookies are delicious little mouthfuls of coconut and apricot jam goodness. They literally melt in your mouth. Their strange name comes from South African prime minister (1924-1929) J.B.M Hertzog. My gran, Oumie, always makes them when we visit and my mom tends to make them for everyone visiting at Christmas time. They are really easy to make and will keep in an airtight container for about a week. Cream the butter, sugar and eggs. Sift the flour, baking powder, custard powder and salt and add to the butter and sugar mixture. Roll the pastry out on a floured surface until it is about 5mm thick. Using a biscuit cutter or lid of a jar about 6cm wide, cut out 24 rounds. You may need to re-roll the pastry to use it all up. Grease a muffin pan (or two if you have two) and carefully press a round of pastry into each hole. Put a teaspoon of apricot jam in the centre of each pastry round. For the filling, separate the eggs and then cream the butter, sugar and egg yolks. Add the vanilla, salt and coconut and mix well. In a separate bowl, beat the egg whites until stiff and carefully fold into the rest of the mixture. Cover each pastry round with the coconut filling. Bake in the oven for 15mins, or until the top of the cookies start turning golden. Allow to cool for 5 mins in the pan and then carefully release each cookie to cool on a wire rack. If you only cooked 12, repeat again with your last 12 cookies. I have been dying to try and make a biltong tart for a while now. I got the idea from my gran who said she'd tried one recently and sent me a few different recipes. I thought I'd try it with spinach, leeks and cheese and do a provita biscuit base which turned out really well! 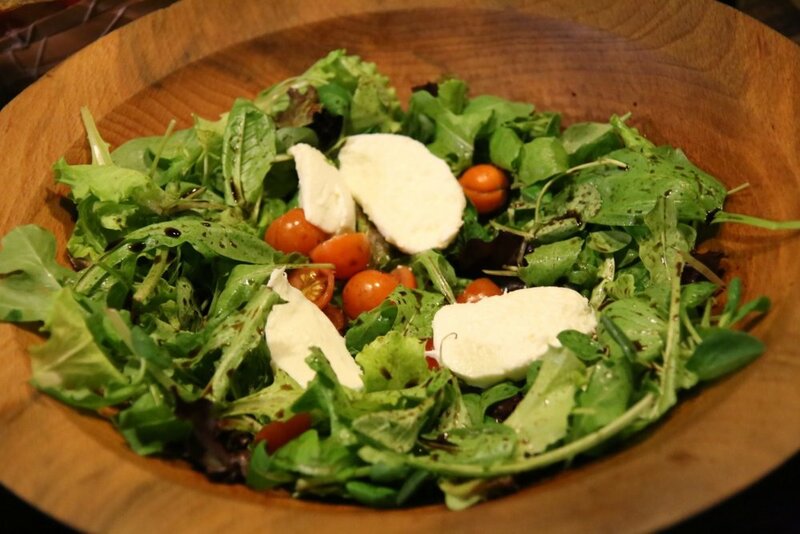 It was so easy to make and super-tasty... it is just quite rich, so a small slice with a side-salad is perfect! Preheat the oven to 180 deg and grease a tart tin. Mix the crackers, melted butter and half of the cheese and press into the tart tin. Add the olive oil to a saucepan and fry the leeks until softened. Add the spinach and heat until wilted. Whisk the eggs with a splash of milk and stir into the veg. Stir in the biltong and season with salt and pepper. Pour the mixture into the tart tin and cook for 40mins until the mixture has set and the top is just starting to brown. Finely chop the onions, tomatoes and garlic. Heat the olive oil in a saucepan and fry the onions until they start to soften. Add the tomatoes, garlic, tomato puree, sugar, herbs, lemon juice and a splash of water. Mix well and add salt and pepper to taste. Cook for 20 mins, stirring occasionally. Cook the boerewors on a Braai/ BBQ or griddle on a low heat for 20 mins, turning half way through. Be careful not to pierce as this will release all of the juices. Butter your rolls, cut the boerewors into 4 pieces, putting one in each roll and top with the tomato sauce. Muffins are really popular in South Africa as a breakfast compared to England where they are viewed more as a cake. They make such an easy breakfast as they are quick to make, freeze easily and you can just grab one on your way out the door to have with a piece of fruit. The bran and fruit make them a bit healthier than your standard muffin too! This recipe makes 48 muffins which is loads for me and Chris so I do sometimes halve the batch (You also need a huge bowl to be able to make the full batch!). They aren't very nice if you don't leave them for at least 24 hours before baking so you do have to prepare ahead a little bit! I don't know why that is, maybe something to do with the bran absorbing the liquid, but if you bake them too early them come out quite dense and stodgy. You can keep this mixture in your fridge for about a week and just bake muffins when you want them, so you can have nice fresh hot muffins straight from the oven. Once baked, I freeze any that we don't have in a couple of days in a big freezer bag and take one out in the morning on my way to work. They defrost very quickly, so are easy to have as a morning snack. Add the eggs and sugar to a bowl and beat until thick and creamy. Add the oil and beat, then add bran, milk, flour, bicarb, salt, vanilla essence and raisins. Pour the mixture into a plastic container with a tight fitting lid and leave in the fridge for at least a day before baking. Pour into a lined muffin tin and bake at 180 deg celsius for 20mins. Note: In the UK, you will probably have to buy bran from a health shop, I haven't seen it in a supermarket yet. I just buy a natural wheat bran in our local health shop. I friggin' love Chai Latte... with its sweet, milky, spicy aroma. It is one of my favourite treats whenever I go to a cafe. Most of those that I have tried are really sweet and tend to come from a ready mixed powder, so I have started to buy the chai teabags for when I want something a bit less sweet. Last weekend we went to Somersault festival and there was a whole beautiful chai tea tent decorated inside like a berber tent. I bought a chai latte and they crushed the spices and everything in front of you. My other favourite hot drink is rooibos tea. When I arrived in the UK I had to buy it in South African shops, but it has recently become more popular and you can buy it everywhere now (usually known as Redbush). I didn't actually like Rooibos growing up in South Africa, even though it is a standard in all South African kitchens, I just didn't drink it. But when I moved to the UK and tasted it again one day, I have drunk it ever since. It is so refreshing and tasty. It is also naturally caffeine free and is really good for you, with all sorts of health benefits. Crush and shell the cardamom pods, discarding the pods and keeping the little black seeds. Add the cloves, peppercorns, cinnamon and cardamom seeds to a pan and toast over a medium-high heat. Keep stirring to ensure they don't burn. The cinnamon sticks can burn really easily, so keep a close eye on them. 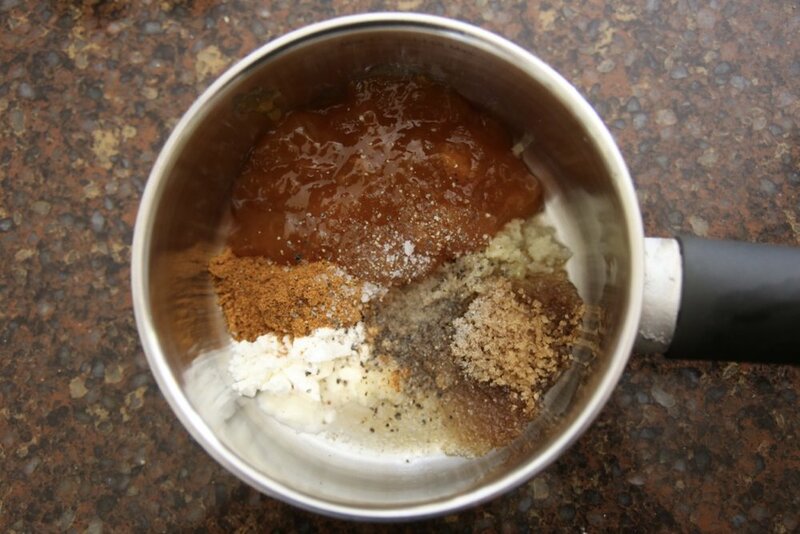 Add the toasted spices to a pestle and mortar and crush. Mix the crushed spices with the ground ginger and the loose rooibos tea leaves. To make rooibos chai latte I just mixed 2 teaspoons of the spice mix with a cup of milk and heated them together in a small pot. I think this would be nice to try with some almond or rice milk for a change too. And you can sweeten it with a bit of honey or whatever sweetener you fancy. So, I finally got around to making Oumie's rusks. Oumie's rusks are different to Ouma Rusks, in that the recipe comes from my Ouma, who I call Oumie, and they are so much tastier than the plain buttermilk South African rusks that most people buy. Oumie has been making these for many years... she makes huge batches of them and sells them to friends in Kriel (the mining town where my grandparents live in South Africa). I have many childhood memories being served a breakfast of tea and rusks in my grandparents' bed by Oupie (my granddad). If you have not tried rusks before, they are like hard, dry biscuits (a bit like biscotti) that you need to dunk in tea or coffee to be able to eat them. They are usually eaten for breakfast or as a snack, and some people give them to babies to help with teething. I have only made them a couple of times now, and they take a long time to make, but I think they are totally worth the effort! If you store them in an airtight tin they will last ages, so are perfect for making in large batches and then grabbing as a quick breakfast. They are great for camping or festivals or to have with tea at work or on the train if you have a rushed morning. I halved the recipe as I haven't made them before, I didn't want to waste it if it flopped (my first batch was a bit of a flop, but we still ate them all!) and I have a really small kitchen! Whether you make the whole recipe or halve it, you will need a very big mixing bowl, one or two large baking tins (I made half the mixture and used one 25x25cm deep tin) and one or two large baking trays for drying out the rusks. 2. Heat and stir the butter and sugar until the butter has melted and the sugar has dissolved. 3. In your large mixing bowl sieve the flour, salt, baking powder and bicarb, and then add the oats, coconut, crushed bran flakes, wheat bran and sunflower seeds and mix well. 4. In a separate bowl beat the eggs and stir in the buttermilk. 5. Add the melted butter/ sugar to the dry ingredients and mix, then add the egg/ buttermilk mixture and mix thoroughly with your hands ensuring there are no dry bits left. If you need to, you can add a drop of milk. 6. Grease your tin and line with baking paper. Pour your mixture in filling about 3/4's of the tin. It will not rise very much and you want your rusks to be quite high. Wet your hands to flatten and smooth the mixture. 7. Bake at 170 deg for 1hr. Test with a skewer - it should come out clean, so if it doesn't return to the oven and cook a bit longer. It should feel firm and springy. 8. As soon as it is cooked, take out and cool on a wire rack. When it is completely cool, cover with foil and leave until the next day. 9. Move the cake to a board or tray so that you can cut it up. If the sides look burnt you can cut them off. When you cut it, it will be quite firm, like a Christmas cake. Cut into long slices and then lie each slice on its side and cut into rusks. 10. Line the rusks standing up on a baking tray, leaving a little space between each rusk. 11. Dry them out in the oven at 90 deg for 5-6 hours. Put a teaspoon in the side of the oven door to keep it slightly open and avoid steaming the rusks. 12. Test by breaking a rusk apart - it should be completely dry. This post is dedicated to Oumie - the best Ouma anyone could ask for! Thanks for all the good memories!